Our graduate programmes move beyond traditional education boundaries and emphasise a multi-disciplinary focus - design, innovation and entrepreneurship are seamlessly integrated into the curriculum. A unique graduate program that aims to promote design thinking and innovation across several fields of knowledge. Offers both fresh graduates and working professionals the opportunity to explore independent, research-oriented solutions to existing engineering challenges. Be part of the next generation of urban researchers, analysts and practitioners who will plan and shape the cities of the future. Conduct cyber security research and training at SUTD’s world-class testbeds to learn how to design, analyse and manage cyber security for critical networks and infrastructure. Research the next generation of computing, photonics, biosensing, manufacturing, and AI technologies by learning how to design at the nanoscale. Collaborate with the best minds in a fluid and stimulating setting and conduct breakthrough research that will make a difference to the world. Experience the best of both world-class institutions - SUTD’s innovative and flexible curriculum and NUS’s established graduate programme and research track record. Be a full-time salaried employee at partnering companies in Singapore while pursuing full-time PhD studies at SUTD. Provides graduate students with industry-relevant training, which is important to translate research & development (R&D) into tangible products, systems and services. SUTD graduate students conduct innovative, multidisciplinary research to design tomorrow’s technology today. Discover more about graduate student life through events by the Office of Graduate Studies. Read more about the accolades garnered by our students, faculty and staff. Subscribe to our graduate programme mailing list. 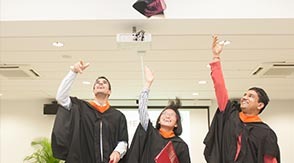 Find out more about graduate programmes here.